Definition of MRSA by the CDC: Methicillin-resistant Staphylococcus Aureus (MRSA) is a type of staph bacteria that is resistant to certain antibiotics called beta-lactamsmost. 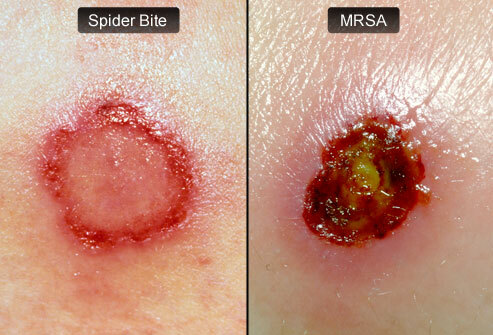 MRSA infections are skin infections. More severe or potentially life-threatening MRSA infections occur most frequently among patients in healthcare settings. My father was in a work related accident about two and a half years ago where he shattered his ankle and has had a very long recovery due to his Type 2 diabetes. My father is 61 years old and now is able to walk and do stuff around the house but while in recovery with his surgery he got MRSA at the rest home facility he was staying in. At first I knew very little about MRSA -- all I knew was that it could be contracted from another person. Having diabetes complicates things, as you must take care of your feet very well because any open sore or infections can result in amputation of that affected area because diabetics take longer to heal. This is because diabetics have less circulation running to their feet. It is easy to become unaware that you have open sores because a condition called neuropathy makes feet numb, and that is why my father needs to use stockings for the rest of his life because he does not have enough circulation running. The reason that diabetics have a higher risk of getting MRSA is because if they have open sores it puts you at risk to MRSA and other infections. I am thankful my father did not suffer too much and have too many complications with having MRSA, but in some cases you can die of MRSA. The problem is MRSA is difficult to treat once you become infected. I honestly think that if my family was not going every day to visit my father in the nursing home, they would have paid less attention to him, and it would of possibly been a fatal and ugly situation that could have led to my father having an amputation. My father is so afraid of ending up like his father, who also had diabetes. By the time my dad's father passed away, he was only a torso, since his limbs got gangrene that ate up his flesh and had to be amputated. I would hope this story inspires others to take better care of themselves and learn more about what a diabetic goes through so they can second guess if they would like to go through what both my father and grandfather did.